Sharpen your own cultural intelligence - and increase your professional effectiveness at the same time. Whether traveling abroad or working at home, professionals routinely face challenges when it comes to understanding the culture of others. When misunderstandings occur, relationships suffer. The good news is that cultivating cultural intelligence is a skill that can be learned, and Brooks Peterson tells you how. Packed with dozens of engaging stories, cases, and humorous contemporary cartoons by the author, Cultural Intelligence: A Guide to Working with People from Other Cultures (Second Edition - 2018) is the perfect antidote for overcoming cross-cultural differences, improving workplace communication, guiding solid business relationships, and contributing positively to your organization's bottom line. 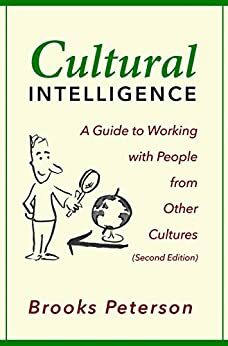 In this in-depth companion to the Peterson Cultural Style Indicator™, Dr. Peterson defines cultural intelligence and uses a clear and rational approach to explore the skills and characteristics required to work effectively with international clients, customers, and business partners - or inside any team, department, or organization with a rich mix of cultural perspectives. Using a set of 25 professional- and business-oriented dimensions, the author helps you examine your own cultural style and determine that of others in six vital areas of style: management, strategy, planning, personnel, reasoning, and communication. The crowning piece is a suite of key action steps for increasing your own cultural intelligence. 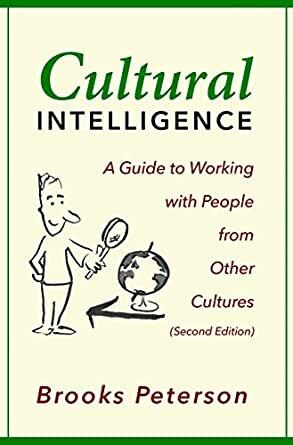 Building on the success of the bestselling original edition of Cultural Intelligence (Intercultural Press, 2004) this updated 2018 edition offers about 25% more material, including reflection questions at the end of each chapter, updates for today's digital world, and many improvements based on valuable feedback from professors and past readers. Normally I’m not a fan of new editions... why not just write a new book? Brooks answers this question forcefully in his introduction when he speaks to bringing more modern examples to bedrock principles that have not changed in the decade since his last stunning publication of this same title. Blending together the need for cultural self awareness, competency, evaluation, understanding and paths to growth in one easy to understand and fun to read book distills the essence of decades of experience into a well-crafted, smooth drink of knowledge that packs quite the intellectual punch. As an educator and administrator in international education, and as management professional, I have recommended the First Edition to literally hundreds of people and made it required reading for some of my team members. No other book on the complexities of intercultural competence has achieved the level of edutainment as the original... until now. Despite devotedly reading the first edition a dozen times,I could not put down this welcome update that far exceeded my expectations and quelled my biases towards “second editions.” Merci. Gracias. Shey shey. Kop Khun Krup, grazzi... and, as you note the use of the term in inoffensive generalities, a good “American” thank you. 5.0 out of 5 starsKnow thy cultural style! A must read for anyone interacting with different cultures - business or leisure a must read.